Liming - Why is it so important? As farmers begin to wrap up harvest, one of the many decisions they will be making include whether or not to apply lime. It has long been a best management practice to try and maintain most soils at a pH range of 6.0-7.5 for the best crop yields. There is a long list of benefits to liming, but here are three of the top reasons for liming your soils. Improves soil nutrient availability to plants. Improves the effectiveness of some herbicides. 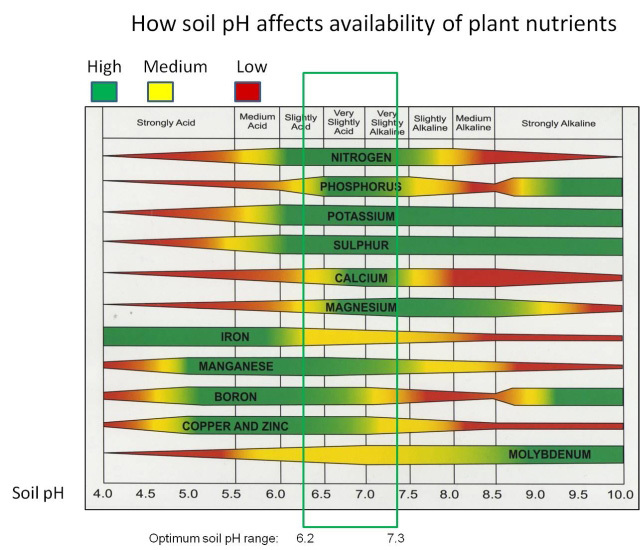 As you can see in the chart below, the 3 major nutrients of nitrogen, phosphorus, and potassium show the best availability at a pH range of 6.5-7.3. Fortunately, this same range applies to most of the secondary and micronutrients as well. Some research has shown that when the pH drops into the 5.5-6.0 range we can lose as much as 25-50% of our nutrient availability. By applying lime, growers will be improving soil nutrient availability to plants. Another benefit to applying lime that most growers don’t consider is the biological activity. The optimum soil pH for bacteria is 7, with a range of 5-9, and the optimum soil pH for actinomycetes is 8, with a range of 6.5-9.5. Both bacteria and actinomycetes play a large role in the decomposition of organic matter. The optimum pH for fungi is 5, but they can survive in a pH range of 2-7. Some of these fungi are pathogenic and cause root diseases. By applying lime and maintaining a soil pH above or near 6.5, farmers also aid in beneficial soil biological activity. Soil pH plays a major role in pesticide effectiveness and degradation. Most herbicides perform best at a soil pH of 6.5-7.3. However, some herbicides can remain active in the soil when the pH is outside of the 6.0-7.0 range. Some of the sulfonylurea and triazine products are more available for plant uptake and have a longer persistence in soils with a pH above 7; while some of the imidazolinones have a longer persistence and are more available for plant uptake in soils with a pH below 6. It is also possible to reduce the effectiveness of triazines when soil pH is below 6.5. By maintaining a soil pH near 6.5, growers can reduce their risk for herbicide carryover and improve herbicide effectiveness. As you can see, liming your soils can have many benefits to growers’ crops and soils. By maintaining a soil pH of 6.5-7.3, farmers can improve nutrient availability to plants which can increase yield potential and plant health. It will also help improve soil biological activity, which plays a large role in residue breakdown and plant health. And finally, by maintaining a soil pH of 6.5-7.3, growers can improve herbicide effectiveness and reduce potential herbicide injury. The list of benefits to liming soils is quite numerous, but the three discussed here are important to growers producing the best yields in their fields. If you have any questions about agronomy issues on your farm, or about liming, please contact your local Technical Team Agronomist. Note: The information in this issue is based upon field observations and third-party information. Since variations in local conditions may affect the information and suggestions contained in this issue, LG Seeds disclaims legal responsibility therefore. Always read and follow label instructions. LG Seeds and design are trademarks of AgReliant Genetics, LLC.